Hello family, friends, and supporters for the [SOUP]! I left my house in the city of Jinja at 6:45 in the morning headed in a matatu to meet our contact in Uganda, Michael, in his city, Iganga. I got to Iganga at about 8:30, met Michael (a Ugandan man who has volunteered so much time and energy for the [SOUP]), and we boarded another matatu to the city of Namutumba. We reached Namutumba at 10:00 then boarded bodas to the village of Isite. It was an interesting ride to say the least, and I know the only way we did not flip was by the power of Jesus! At about 10:45 we finally arrived to the Orange Giraffe. At this point I had been traveling for 4 hours, but any exhaustion I was feeling left as soon as I saw the precious faces of the kids here. The kids were a little nervous of me at first because they are not used to having a mzungu or white person around. The headmaster greeted Michael and me, and we went into the tiny office of the school to have a meeting. We talked about how far the school has come, how many children there are in each class, how many teachers there are, etc. There are 182 students enrolled at the school, but not all of those students come every day. Some might miss school if it has rained or because many of the families are farmers so the kids have to help with the digging and harvesting of the crops. Out of the 182 kids 86 are orphans by the definition of not having a mother and father. There are many more kids in the school who may have a mother or father, but their parents do not take care of them. After our meeting with the headmaster we walked around to each class, and I was introduced to each teacher and class. By this time, a large crowd had gathered across the street, and the community wanted to meet me and see what I was doing. It was a little intimidating to have all thirty of the elders and members of the community staring at me, but they were very grateful that I was there, and they had hope for a bright future. After all these meetings, Michael decided it was time to head to see where the new school was being built. We hopped back on our bodas and drove 2 kilometers to Michael's parent's house. The property for the new school and homes lies right behind his parent's house. His father gave us a tour of the property and the progress that has been made. Nearly 4 of the 8 classrooms are done. All they are waiting on is a roof and a floor. I saw the men working very, very hard to get the school finished. We walked around the property talking about where each building would go. One day this property is going to be a place of joy and a shining light of God's love. After our tour, we returned to Michael's parent's house where they served me a delicious lunch and tea. While we ate we watched Michael's wedding, which was precious. I'm not quite sure how there was electricity because there were no power lines or electricity anywhere else, but it was cool to see his wedding! After this we began the long journey home. I got back to Jinja at about 4:30 and was exhausted but feeling so blessed. 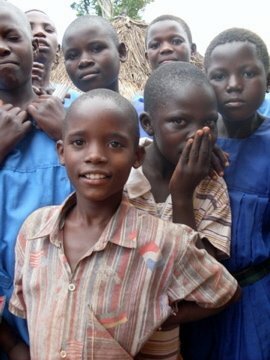 Sorry this has been so long, but I just want to wrap it up with saying that what the [SOUP] is doing is making a real difference in the lives of the kids of Orange Giraffe in Uganda. I'm not just saying this to pull at people's heart strings or anything like that. I am saying this because I have seen it firsthand. The money that is raised and donated is actually being used how it is supposed to be used. The teachers, headmaster, and parents told me countless times how far the Orange Giraffe has come and how they have big hopes for the future. I cannot wait to go back there and work with the kids and teachers some more. And so the SOUP's summer of adventures begins- I (Amelia) am off to Kentucky tomorrow to attend an international summit of orphan ministry leaders. I will be taking copious notes, and keeping you updated with inspiring/profound/challenging ideas and thoughts as I go. Follow us on Twitter for the live updates: www.twitter.com/theafricansoup.